Below you will find a list of high-level topics assembled from our latest eBook. It includes the critical factors schools use to assess applicants. By understanding the criteria, you can a distinct edge in standing out from other applicants. Being salient and standing out can help you ultimate Crush the Odds. Researching government websites and trusted college data sources will reveal a sobering set of admissions statistics. In fact, you will find that the mass media continues to publish an aggregate college acceptance rate in the United States of around 7%. Put differently, approximately ninety-three percent of applicants will need to toggle to a second or third college option. With only 7 applicants out of 100 getting into their first college of choice, applicants are left to scramble. Most students are left to believe in the all-too familiar spray and pray approach. Generating application after application to secure a school during this hypercompetitive process. What if you had a set of reliable factors to help you boost your odds of admission to the college of your choice? In the attached eBook, we address a number of important factors used to determine if applicants are eventually accepted, rejected, or wait-listed. 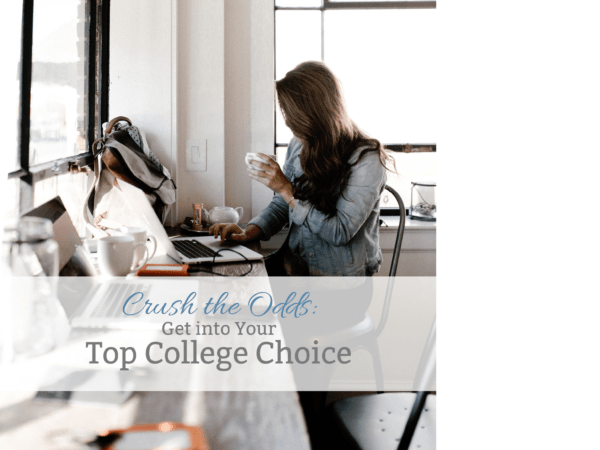 The following factors need to be understood and leveraged to the best of your ability to crush the odds and get into the college of your choice. Find out what effect grades has on college acceptance and degree attainment. Control your grades to make the most of your upcoming college experience. Invest in establishing good study habits – it means far more than a letter grade. How important are standardized tests? Learn the value of a super score? Is a college scholarship in the cards for you? Can you compete in sports for a college program? Will competing in college help my odds of admission? Does every college offer an early decision? What are the advantages of committing to a college early? Do you know what legacy status is? How can you leverage legacy status to get into your top college? What is admission yield and why is it important? How are demonstrable interest and admissions yield related? Learn the best ways to demonstrate interest in a college. Learn how to stand out from other applicants. What factors can help me get into my top college? Discover possible pitfalls to avoid. Be accurate, organized, and focused on your stated goal of attending the perfect college for you. You control a great deal of the college admission process. Once you know what colleges look for in qualified applicants, you simply demonstrate that and reinforce those qualities in an authentic manner. Your goals are within reach when you take the time to understand the college admissions process, invest in yourself, stay organized, focused, and goal oriented. MatchCollege helps millions of students every year and our decade of experience will help give you the key insights to find the perfect college for you. Believe in yourself and hustle to make your dreams come true. Get smart by reading our eBook today along with our highly acclaimed complete guide to the college admissions process today. Enjoy the eBooks and continued success to you and yours! For additional resources, make sure to visit MatchCollege and subscribe to our blog for the latest in college information.